Getting up early in the morning has never been one of my favorite things to do. Especially when it’s way before sunrise and the bed still feels warm and cozy. I get dressed, turn on the coffee machine, pack my snorkel gear and camera and try and wake up on the ride over. I suit up, check my camera and take one last sip of warm coffee before heading out into the water. I know what is waiting for me out there just over the reef, but still the first steps in the water and the first few breaths I take through my snorkel I shiver and question why I’m doing this again. During the swim out I have time to think, organize my thoughts and relax while watching the reef come to life. The rising sun at/on my back casts rays of light that shimmer across the sand and start to bring out the many different colors of the corals and fish. Occasionally I have to dodge a picasso triggerfish or a farmerfish protecting its turf. The jacks and trevallies are already patrolling the shallows looking for a quick morning snack. Parrotfish are still in hiding and the blue-green chromis are still asleep in between the branches of their coral homes. I pass them while in my head I’m singing the lyrics of the Beatles’ ‘Here comes the Sun’ and ‘ Octopus’s Garden’. The reef is close by now and I pass through the break at double speed. The water feels cooler and the visibility clears up once I clear the breakwater. Some of the surgeonfish are already here. More come in by the minute and cover the seafloor like a carpet. I can feel the tide changing and the fish notice it too. Suddenly I see movement in the distance. They are here! Swooping in alone or arriving in a train, Guam’s mantas never seem to be late. Like a Swiss clock they are right on time. But something was different this time. Normally they swoop in and do flybys. They are excited and focused on the fish that are about to spawn. Not this one. A big female moved slower than I was used to. The reason was obvious the moment I saw her. She had a line wrapped around one of her cephalic fins. Attached to the line was a small buoy that floated up behind her. The constant pressure of the floating buoy had caused the line to cut centimeters deep in her tissue. Instantly my adrenaline kicked in and I dove down to see if I would be able to help her. I took a few quick pictures on approach but paid more attention to the line and how it was looped around her. As soon as I made contact with her and the line, she stopped swimming and started to hover motionless in mid water. I tried loosening the rope and was able to get the top out of the cut. Running out of air, I had to get back to the surface to catch my breath before I could dive down again. On my second attempt I was able to move the bottom part of the line. Blood started to ooze out and I could tell she was hurting. The movement of the line in her cut made her jump and I had to go up to get another breath of air. On my last try I approached her slowly from the left and our eyes locked for a second. She slowly closed it and I took it as a sign that she knew what was going on and that I was there to help her. Again she stopped swimming and moved her body more vertical in the water. I slid the rope out of the deepest part of the cut and was able to slide it all the way off. I did a celebration dance the whole 25ft back up to the surface. After catching my breath I saw her slowly take off into the blue. 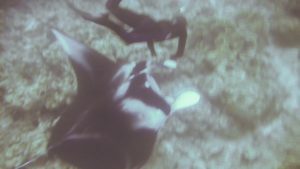 For other mantas it was business as usual. The fish spawned, the mantas ate, and we started taking ID pictures again. On the swim back in thoughts of joy, happiness, excitement and sadness went through my mind. I was excited to have helped out this magnificent creature, but sad that she got in this situation in the first place. We, as a human species, don’t always think about the direct effect our actions can have on the environment. 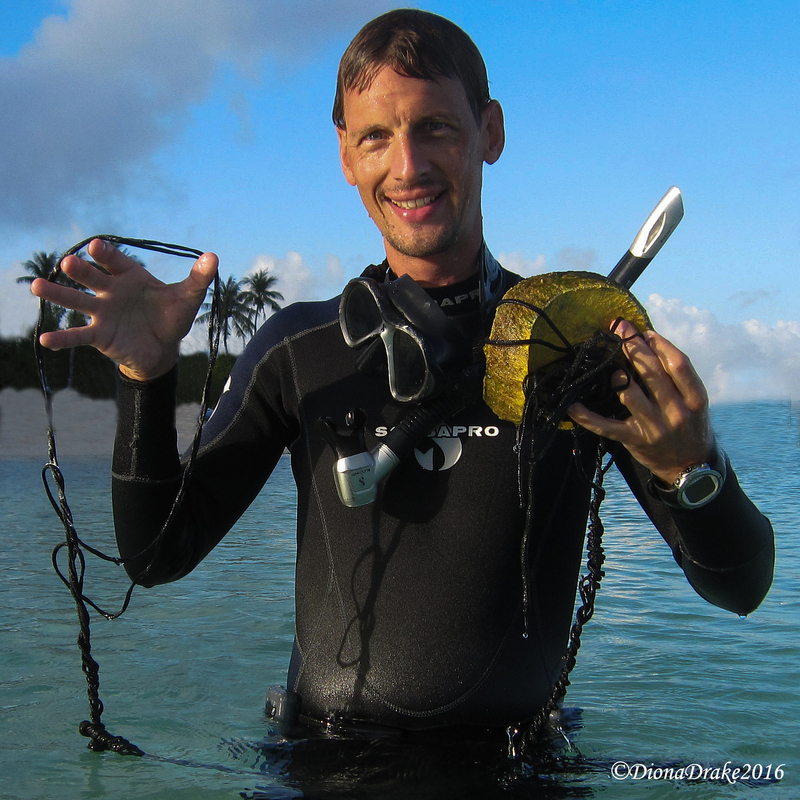 Trash in our oceans is a huge problem, and not just for mantas. Turtles, sharks, rays and fish risk getting caught in lines and eating plastic on a daily basis. Re-use, recycle and think sustainable. 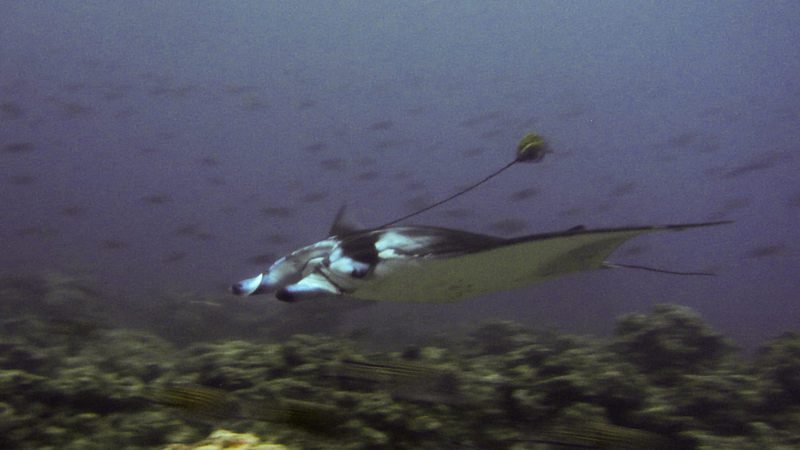 Editor’s Note: Since there currently no laws in place to protect Micronesian Mantas from human interferences, our research locations are confidential to protect the Manta Rays we study. If you do see a Manta in the wild, please remember NOT to touch them, as this can damage their delicate “skin”. Keep your distance, take a photo, and send it to us for identification! Let us know if there is something Fish Eye Marine park can do to support your research or protecting manta ray. Great effort and lovely story. Good for you!